From young years I was interested in showwave (HAM) radio, but due to economical and political situation I never started (you know, the axis of evil- soviet union and etc.) Later I managed to listen some of the HAM radio stations using old JVC radio when I was out of the city. The radio itself is not designed to listen SSB or CW signals, but sometimes I can understand some of the voice talks. Especially Russian HAM users- they sometime are using all AM/FM moduliations and curses every second word. Now, when there are lots of software, there is no need to learn that code. Just dowload software, start it and connect to your radio. 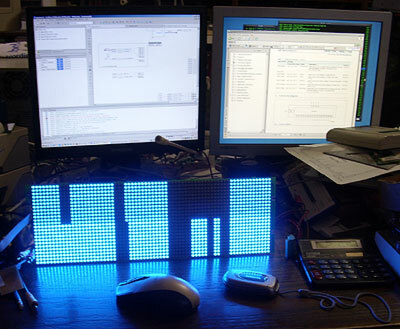 It is RGB LED matrix board! It is some PCB from Adaptive Micro Systems LLC, USA. This comapny specializes in LED advert production. From simple single color static board to full RGB color outdoor monitor. Mine LED board is 72 x 24 RBG LEDs. With dinamic connection and some FPGA control. The protocol of the matrix itself was unknow, so I reverse engineered all the connections between chips and programmed my own FPGA code. After all FPGA pins were traced, the only thing was created whole dinamic display with normal video data. Here is some random data from clock counters. It was very interesting: Red and Green LED are powered from 3V source, meanwhile Blue LEDs are powered from 5V source, also all logic chips are powered from 5V (FPGA has it’s own regulator on board). This is very logical- blue LEDs have higher threshold voltage, RED can work at much lower voltages. So, to keep board cool (regular linear regulators on board), multivoltage PSU is used. Check original post in Lithuanian language. There is interesting information in comments section. If you have some questions, take a note, that this post was originally posted in 2008. This is starting post about very interesting project. Try to guess what it is? This PCB is populated with serious stuff. Big square chip is Altera Cyclone EP1C6T144C8, 30 pcs of MBI5026CD, 8 pcs of HT04 (standard chips), 24 Fairchild power mosfets, 3 linear voltage regulators, one 18.432MHz oscilator, UTP connector with 4 LVDS lanes from FPGA. Byte blaster connector for FPGA programming and FPGA bitstream ROM. On other side there are 1728 components with total 5184 discrete active components. I bought this item in ebay for $130. And it was very expensive for me. When this post was posted, it was 2008 May. The exchange rate for USD was quite low compared to our local currency. Today (2015) we do not have local currency- we joined eurozone. And exchange rate for USD is quite high. 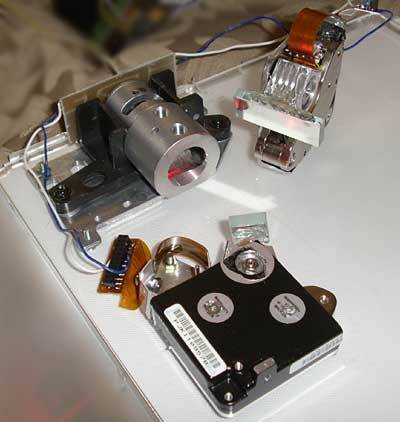 For my laser experiment I am using collimators from old laser printers and copie machines. Especially from copiers. These devices are adjusted for copying process and IR laser. Meanwhile I need to use other settings. It is quite difficult to do this, as everything is very stiff and glued with some warnish. I placed all optics as precise as I can- only 45 angles are allowed (this precise alligment was done using eyeballing only ). The result is much better, but still there is some other problems. Also, the voice coild have it own resonant frequency and in particular situations, the amplitude of the mirror angle is much higher. The main problem is my audio amplifier and Amiga computer emulation. I need low frequency amplifier working from DC to high pitch sound. BTW, all laser mirror are “metal to front” type. They are salvaged from old copiers and laser printers. Regular mirrors have “glass in front” structure, so laser reflects not only from mirror side, but from the surface of the glass. 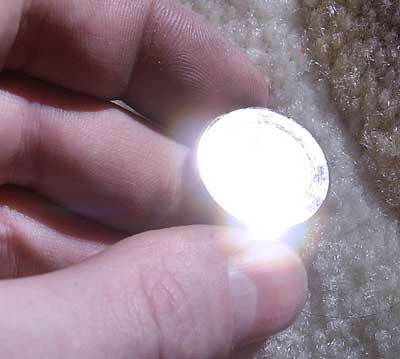 Also, there is reflection in inner glass mass- the beam is reflected many times and lots of light power is lost. For more information, google for “free space optics“. To test laser scanner from older post I am using very old Amiga software Lasermax. The Amiga computer itself is emulated with windows machine. 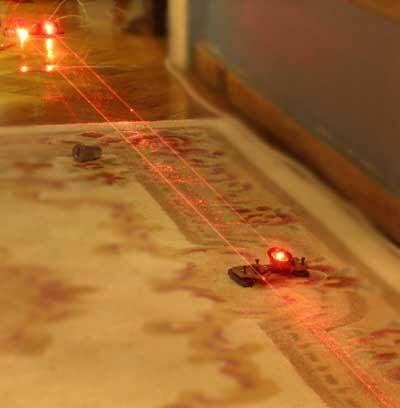 This real 2D scanner mechanics for laser beam. 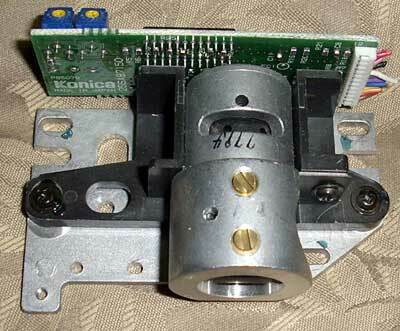 Not face ones with small DC motors, but real mirror system to form real image on some screen or fog. 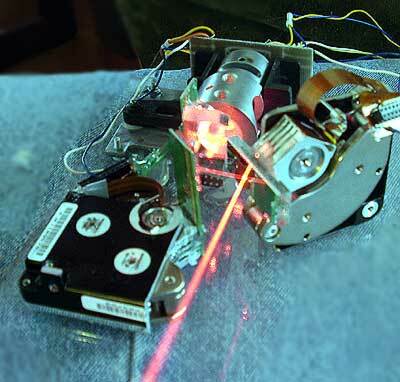 All you need some real good laser source (I’ve used burnig red lasers from DVD recorders), two old hard disks. Some plastic/wood for base, hot melt glue and some electronics skills (or sound amplifier). This is one evening project and not very precise and perfect. First of all we need to cut voice coil and head holder from hard disk body. Remove read/write heads and glue small mirror to the axis. It is possible to make mirrors from hard disk platters. 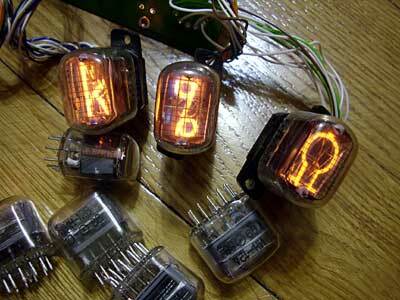 In 2008 my programming skill was too weak, so I ordered nixie (neon glow tubes) clock kit. I had lots of ИН-12Б tubes in my stock, so I used them as my starting design. Tubes were connected to clock PCB with tube sockets, so I had option to swap and test some other tubes. In this series of tubes there several special tubes like ИН-15 and other. They have various symbols instead of digits. 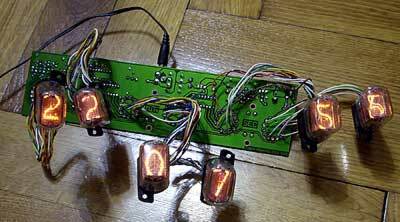 This clock set is based on PIC16F876 MCU, there is step-up power suply on board. For more information check original web page in Lituanian language (comments have some interesting links). 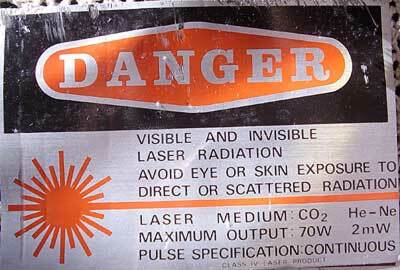 It was “open core” or stream laser, with missing gas preparation system. The only use for it was to open and look inside for details. Output of the laser was 70W, meanwhile power suply for it was … 5kW. Not very efficient. It looks like zinc selenide mirror. Or maybe semi-mirror. Or maybe it is just window to pass infrared waves from laser body to external mirror system. ZnSe is insoluble in water, so the finishing of the optics is quite good. But all gold plated mirrors were damaged. This is piece of mechanical wonder- it is sealed, but adjustable with micrometric screws. 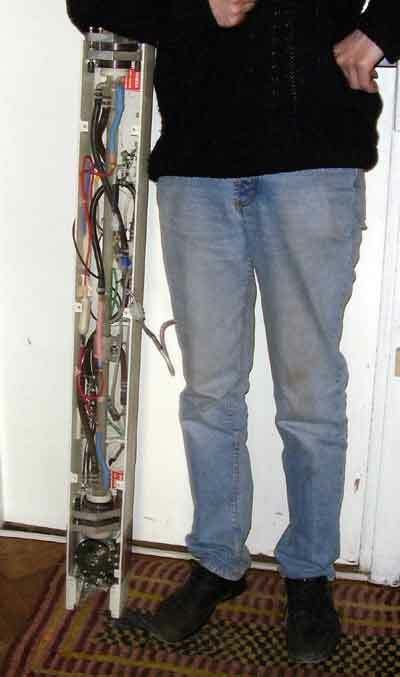 It is visible connections for watter cooling, gas flow (It is open tube, flow laser) fitting and high voltage connection. 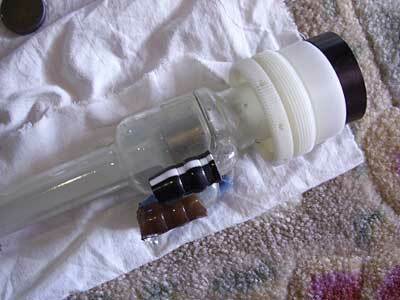 Laser tube was damaged and cracked. 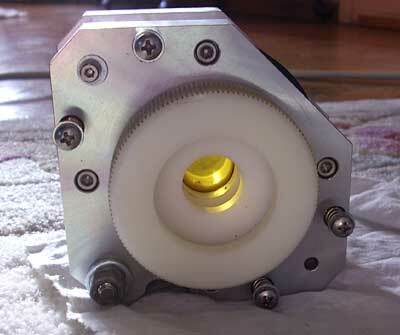 And without gas preparation system, flow laser are useless.